As a crosstrainer, the Octane Q47 elliptical provides a simply extraordinary workout experience. The company has made breakthroughs in Body-Mapping Ergonomics and the QuadLink Drive for a great smooth motion. Thanks to these advanced features, it can make a claim to be one of the best machines on the market. 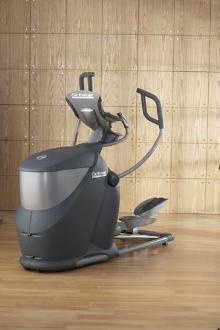 The Octane Q47 elliptical features SmartStride technology and Hip Indexing Pivot (HIP). The system measures your hip height (leg length) and movement speed, and then customizes the stride length accordingly to optimize your muscle requirement during the elliptical workout — whether you are in a walking, jogging or running motion. Electronic Stride Adjustment 18" - 26"
Fitness experts and personal trainers will tell you that true adjustable stride machines, like the Octane Q47, promote better muscle activity. For example, the “adjustable stride” on the incline CrossRamp of a Precor EFX elliptical isn’t so much of a variable stride pattern as it is just a different angle of the same elliptical motion. Octane’s Q47, on the other hand, when extended to the full 26", simulates a feeling of running even though your heels never rise up off the pedals. For first-class ergonomic feel, you won’t find a machine that can rival this model right now. New owners of the Octane Q47 also have experience with high-end Precors, and they attest to the superior ride of this crosstrainer. Users who comment in elliptical reviews also rave about the advanced body-mapping ergonomics and the wonderful stride. The computer-controlled adjustments position your body for optimum results during your training. In addition, the handlebars converge (instead of staying straight) to give the users more of an aggressive yet comfortable motion during heart rate workouts. Octane has made a splash with the Q47 elliptical series. Hands down, this model just feels better than anything else you’ll ride, and it is technologically and bio-mechanically superior to its main rivals, Precor and Life Fitness. The upgraded models (Q47e and Q47ce) feature advanced electronics such as digital contact heart rate sensors, and programs like Cross-Circuit™ and intervals. The Octane Q47 is a marvel of a machine in terms of adjustability and ergonomics. It would be well worth the full asking price — if it did not have issues with quality, and an inferior warranty. We won’t know for another four or five years if the new Octane Q47 elliptical will holds up in value to its $3,800 retail price. Still, it’s recommended — if you can find it on sale for less than $3,400.